My boys are coming. My boys are coming. It’s Saturday morning and we were up late at our staff Christmas party last night, but I sprang out of bed with the call to prayer at sunrise. We have that auditory time regulator here in Tunisia. I love it. I’m Tabitha Tittlemouse today. Oh gosh, I love The Tale of Mrs. Tittlemouse and her fastidiousness over every tiny detail, every tittle. How about this line from the Wikipedia synopsis: Mrs. Tittlemouse fears she “shall go distracted” as a result of the turmoil and takes refuge in the nut-cellar. You know where to look for me if I need a little time out this week, though all that’s in our cellar is wine, no nuts. There’s so much I want to do: make up heavenly beds for jet-lagged boys to sink into, prep the basics of some midweek feasts so we can have friends over to enjoy the season and visit with the guys, and make cookies. I think that this is going to be my nervous distraction for the next 24 hours, minus sleep, while I’m picturing them at every stage of their journey. I can’t just pick any cookie recipe and pull it off, here. I looked at Bon Appetit’s 31 days of cookies and I can get many of those ingredients here, but often there is just one missing ingredient, like corn syrup, that makes me think they won’t come out right without it. As with all things in Tunisia, it’s best to begin with what we’ve got. There is actually a treasure trove of special ingredients available at the moment. 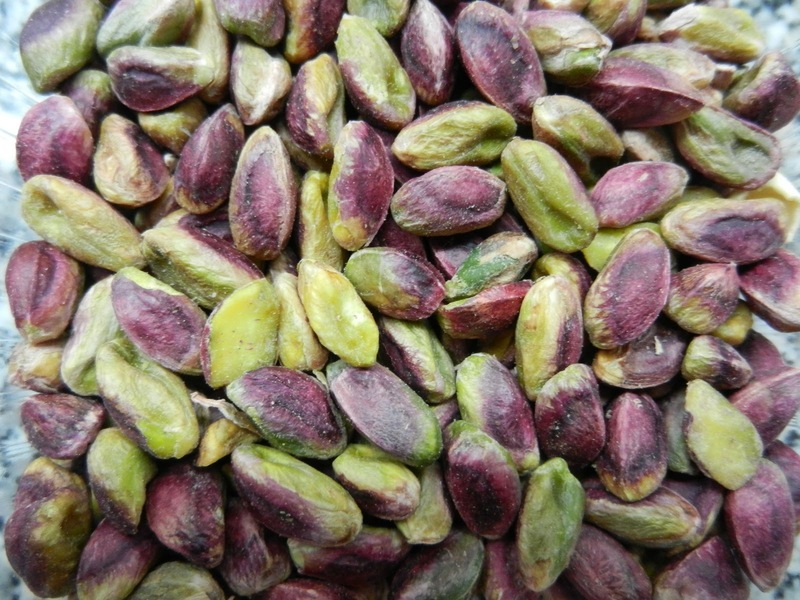 A local store had bulk-packaged quantities of the following this week: hulled pistachios, shredded (unsweetened) coconut, dried apricots and hulled, toasted sesame seeds. Added to that are some plump golden raisins and dried pears I bought in Nice and finally, some dried Montmorency cherries gifted to me by Shelly. And I have ginger. My friends and I are always so concerned that we can’t get ginger here that we buy it in large amounts every time we see it. It turns out that ginger has been available recently, both fresh and dried, like the stuff you see in the Chinese apothecary shops in China towns, and I now have all of the forms required to make a triple- ginger cookie, one of my very favorites. Because I knew it would occupy the most oven time, I began with biscotti. 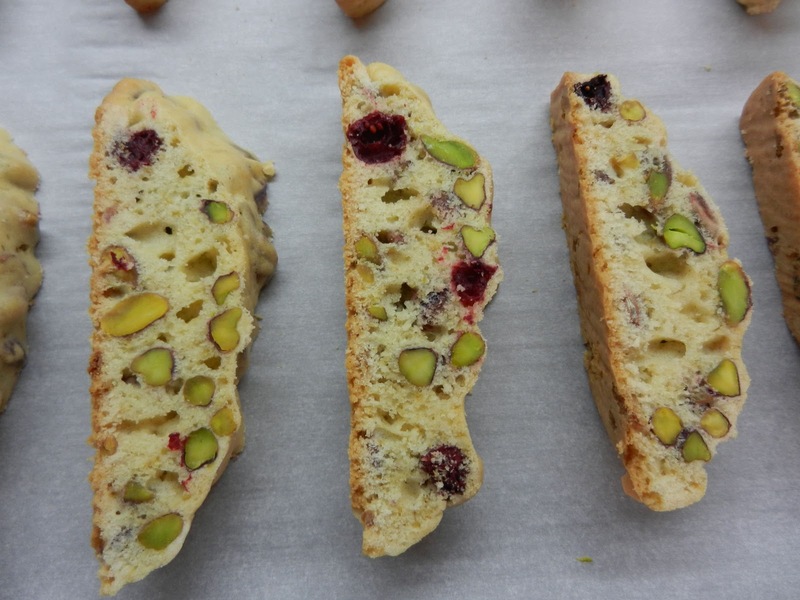 Cranberry/pistachio biscotti must be ubiquitous. Recipes kept popping up all over. My one unavailable ingredient in this recipe was almond extract and I do think it would have been a fine addition. 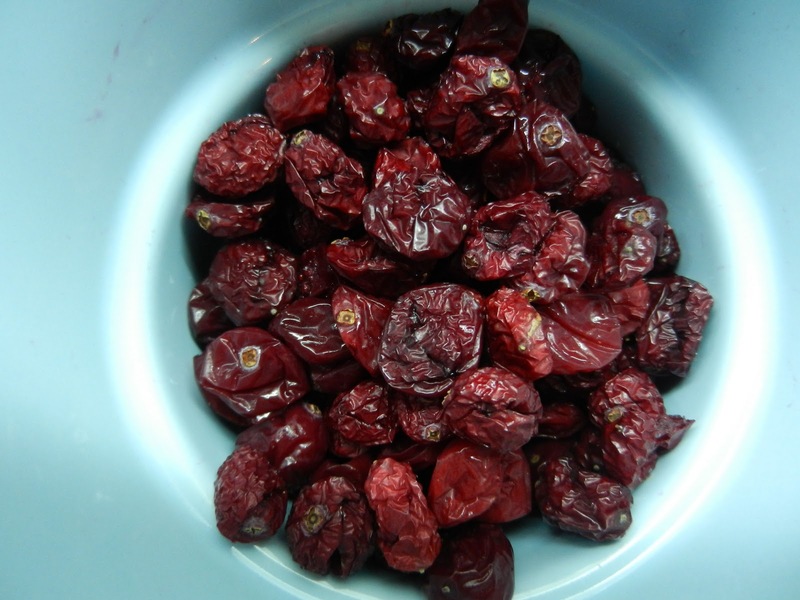 I dried the cranberries in my food dehydrator on Lummi Island when I was home in October. They took an extremely long time to dry. For about 24 hours, they were just hot, plump, berries not looking like they were getting any more shriveled. So I started poking them and squeezing air out and finally some of them dried out and some didn’t so much. I tossed them in a Ziploc anyway and brought them back here, keeping them in the freezer. These are the end of them. 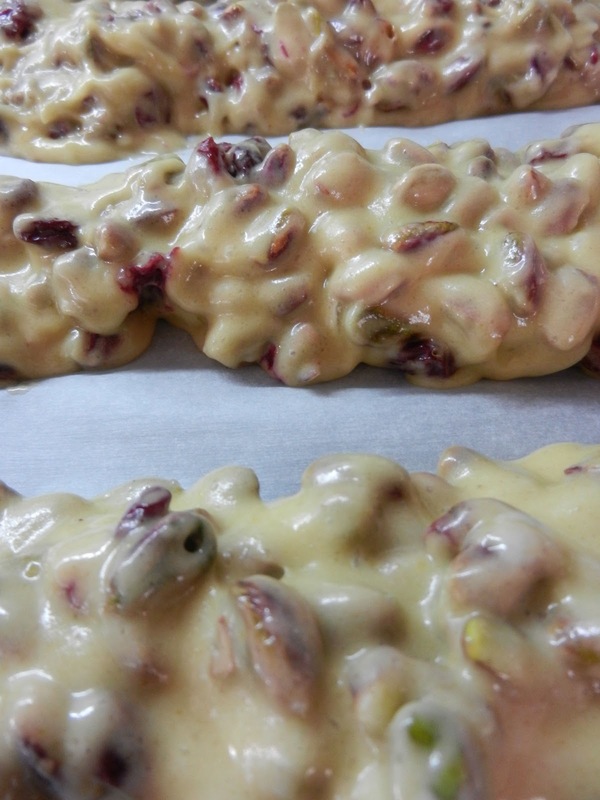 Once baked, sliced, and then oven dried, the pistachios in the cookies become deliciously nutty and the little bit of tart cranberry creates a bright accent. I’m not even going to dip them in chocolate because I really like the vanilla/nut balance as it is. Divide dough in half. Form two logs (12×2 inches) on a cookie sheet that has been lined with parchment paper. Dough may be sticky; wet hands with cool water to handle dough more easily. for 10 minutes. Reduce oven heat to 275 degrees F (135 degrees C). approximately 8 to 10 minutes, or until dry; cool. So that’s the first cookie and I am planning on a line up of five in the next 24 hours. I just gave the boys a wake up Skype call and they are officially underway. I’ll keep posting as I bake (is this fun?). You can bake along with me if you’re inclined.